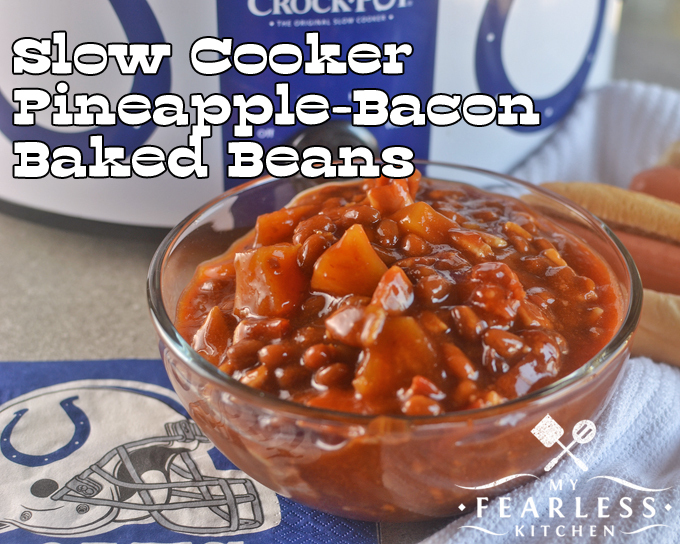 Make these Slow Cooker Pineapple-Bacon Baked Beans in 10 minutes for your next summer picnic or tailgate party. They’re so good, there won’t be leftovers! 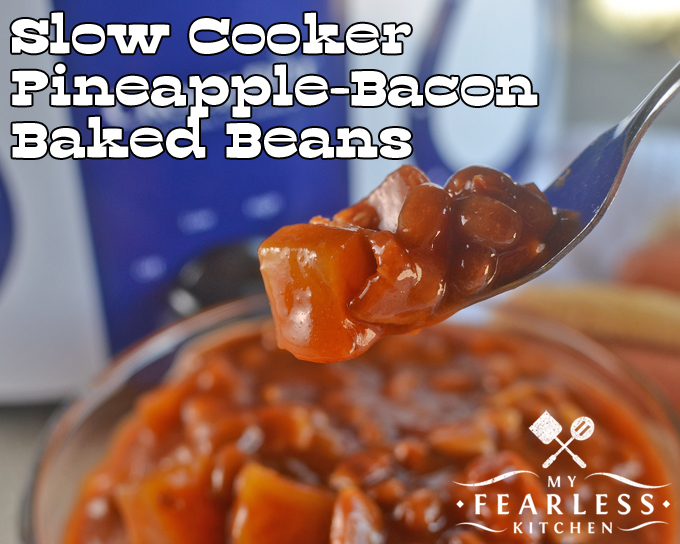 You had me at bacon… Seriously, baked beans by themselves are pretty good. But when you add in lots of bacon? Well. This is the stuff! I came across this recipe in “Slow Cooking All Year ‘Round” by Gooseberry Patch, and I just knew this was going to be making an appearance at our tailgating parties this fall! I know that it’s tempting to cut some costs on bacon when you’re putting it into a recipe like this. But this is actually the time to splurge on the good bacon! (Although, really, is bacon ever bad?) Cut about 1/2 pound of bacon into bite-size pieces (I won’t tell if you use more than a 1/2 pound) and toss it, uncooked, into your slow cooker with the baked beans and the rest of the ingredients. Since the bacon stays in pretty big pieces in this recipe, you’ll really get great bacon flavor with each bite. I used Bush’s Original Baked Beans in this recipe. I checked out all the other flavors in my grocery store and decided that since I was going to be adding so many other flavors that I wanted to keep it simple. Though I’m sure this would still taste delicious, no matter what variety of baked beans you use. I know the pineapple with these baked beans sounds like a strange combination. But when you add in the barbecue-type sauce, lots of brown sugar, and bacon, the flavor combination is absolutely delicious! It’s perfect with hot dogs or hamburgers, as a tailgate party side dish, or with anything else you want! It doesn’t look like it, but you’ll definitely want to use a 6-quart slow cooker for this recipe. I started with my tiny 2-quart Crock Pot (because how much room can a can of baked beans and a can of pineapple take up?) and pretty quickly realized I wasn’t going to have nearly enough room. If you want a really cool Colts Crock Pot like mine, you can get one here. Don’t worry, they have other teams, too, if you’re not a Colts fan. How to Convert Oven Times to Slow Cooker Times – free printable! Which Measuring Cup Should I Use? 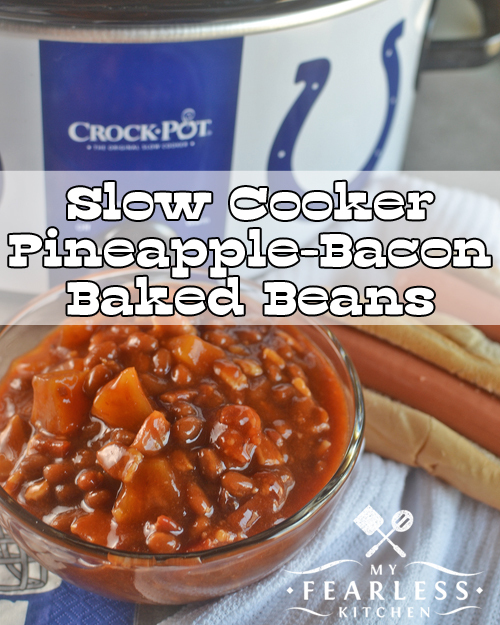 Make these Slow Cooker Pineapple-Bacon Baked Beans in 10 minutes for your next summer picnic or tailgate party. They're so good, there won't be leftovers! Add all ingredients to a 6-quart slow cooker. Stir well. Cover and cook on low for 3-5 hours. bacon AND pineapple??? Yes please! Thanks for sharing on Homestead Blog Hop! Isn’t that one of the most perfect combinations? !